The Norwegian Viking ship Draken. The world's largest Viking ship to sail in modern times is currently on an East Coast tour, and will make a stop at Penn's Landing over Labor Day weekend. The Draken Harald Hårfagre measures 115-feet from stem to stern and has a 79-foot mast. At the front, there is a traditional dragon's head. 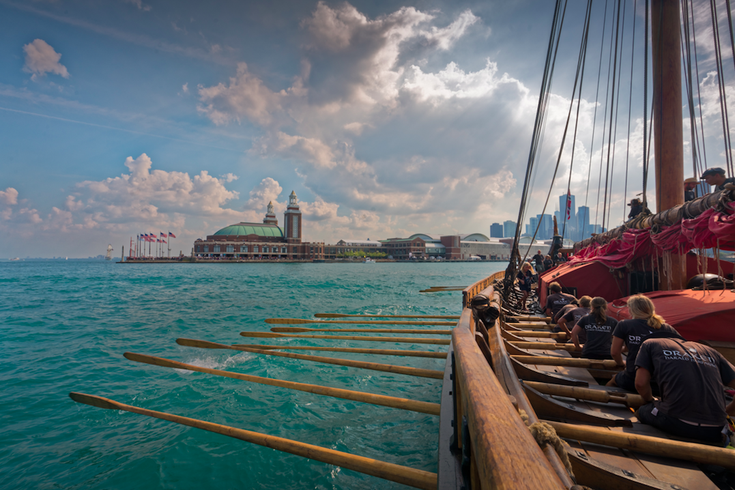 The Viking ship, which was constructed by a team of experienced boat builders, historians and artists, will arrive in Philadelphia on Friday, Aug. 31, and stay for a total of seven days. It will dock outside the Independence Seaport Museum. To welcome the Draken and its crew, there will be a free ceremony at 10 a.m. Then, from Sept. 1 through Sept. 6, waterfront visitors can take a deck tour of the ship and check out the Draken Village, where there will be a free photo and video exhibit. Tickets for the 30-minute tours are $7 for kids age 5-16 and $14 for adults. There are also $35 family packs, which grant admission for two adults and up to three kids. In 2016, the ship and its crew went on its first transatlantic voyage from Norway to the U.S. The aim was to explore the world like the Vikings did more than 1,000 years ago. "Each Draken stopover (on the East Coast tour) offers guests a tangible tie to history. We hope our visitors are inspired by the vigor of the Viking spirit and our modern-day adventures," captain Björn Ahlander stated in a press release.